"One of the finest dessert apples, a rival of the Ribston Pippin, excelling it in juiciness, and being of a better size for dessert." Whilst its origins are unknown Hogg reports evidence of cultivation at Brompton Park Nursery in the 1750s. He also suggests that the variety is French in origin, partly from its name, and partly because one of the partners in the Brompton Park Nursery had previously worked in the gardens at Versailles. This makes Margil one of a select band of apple varieties with a documented history going back more than 250 years. Margil's contemporaries include Court Pendu Plat, Ashmeads Kernel, and Ribston Pippin. These are all varieties with strong appley flavours, but with the exception of Ribston Pippin, which had some commercial success in the first half of the 19th century, they have all remained minor varieties and relatively unknown. 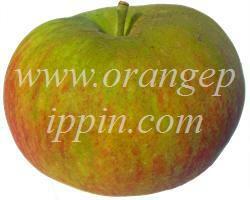 Court Pendu Plat and Ribston Pippin both seem to have come from France or the Continent, like Margil. To apple lovers of the 21st century, Margil is in many ways the most accessible of these 18th century varieties, with more delicacy than Ribston Pippin and a less provocative flavour than Court Pendu Plat or Ashmeads Kernel. It is a fairly small apple, with an attractive flushed appearance, and a strong, clean, well-balanced flavour which puts it very much in the mainstream of modern Cox-style apples. Only the tendency to russetting might be held against it. 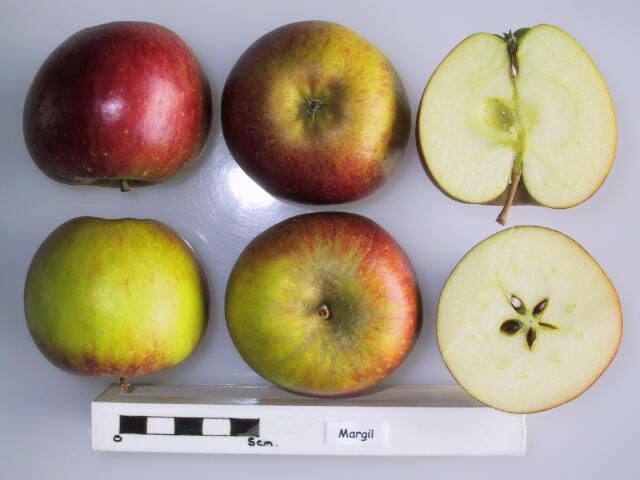 Although separated by at least 200 years, Margil is quite similar in flavour to Braeburn, and has no trouble holding its own against modern varieties. Incidentally, notwithstanding the Cox-like characteristics, there is no known link with Cox's Orange Pippin - which in any case is widely believed to be a seedling of Ribston Pippin. However, trying Margil and Cox side by side, the flattened shape, the flushed russet tones, and the tremendous depth of flavour all suggest that somewhere there must be a common ancestor. Although it has many excellent characteristics, Margil has faded from view, and is now almost impossible to obtain. However the variety is still available from specialist apple tree nurseries, so this is the best way to experience Margil - and to try a taste straight from the 18th century. Got a sample of this from Scott Farm, VT last January. Great flavor despite travelling across the country and too much time at room temperature. Worth seeking and growing. I have inherited a Margil tree in my allotment, and have just today had the variety identified at the Botanic Garden in Cambridge. I have enjoyed the apples very much for some years - they are small but have a lovely aromatic and sweet taste, and are not at all woolly as some Cox apples can be. I wondered if they were Cox, and that the reason they tasted better than a bought Cox was that they were fresh off my tree - so it is a lovely surprise to find they are actually such an old variety. The tree itself is very ancient and propped up with a stake - I will try to keep it going as long as I can! I have a single Margil tree grown on dwarfing stock as a rather haphazard sort of cordon! It grows near a South facing wall with shade of other trees to the East. It gives apples of a fine delicate flavour with an excellent crisp, juicy texture. It is, however a pig to grow as it has been plagued by bacterial canker and looked to be producing an excellent crop this year until canker struck and prevented any apples from maturing. I love this little tree but it fails to repay such feelings!! Took my first bite of a Margil today, (prompted by Edward A. Bunyard's "The Anatomy of Dessert" and morning luck at the farmer's market). This Margil was thoroughly russetted, so the expectation of something bosc pear-like in flavor was met. What was unexpected and quite pleasant were notes of pineapple mingled with apple. The Margil is a delightful apple worth seeking out. Ribston Pippin - Margil and Ribston Pippin both originate from England in the mid 18th century but with strong links to France.